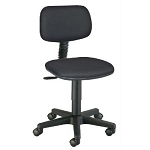 Extremely comfortable and stylish like its big brother, the Salambro, this finely crafted chair comes complete with arm rests, pneumatic height adjustment from 18" to 22" and a 24" diameter reinforced nylon base with hooded casters. The extra thick molded foam seat cushion 18"w x 18"d x 3½" thick and has a 2-to-1 synchro tilt mechanism. 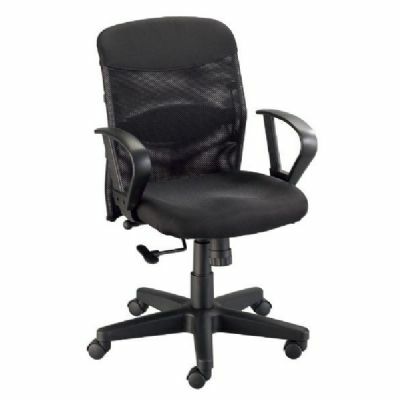 For every 2° that the back reclines, the seat automatically tilts 1°. 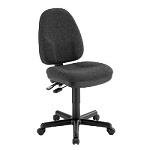 The vented mesh backrest is 18" wide, rises18" above the seat and has a spring-adjusted rocking mechanism that can be locked into the upright position if you choose. 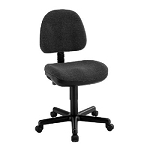 A padded lumbar support can be adjusted up and down for comfort. Black only.